This sculpture was created by Danish sculptor-activist Jens Galschiot to mark the 8th anniversary of the 4th of June Tiananmen Square protests (1989). The fifty torn and twisted bodies of the sculpture symbolize the degradation, devaluation and lack of respect for the individual. The black original color was meant to symbolize grief and loss and the sculpture, which represents the victims and expresses the pain and the despair of the event. 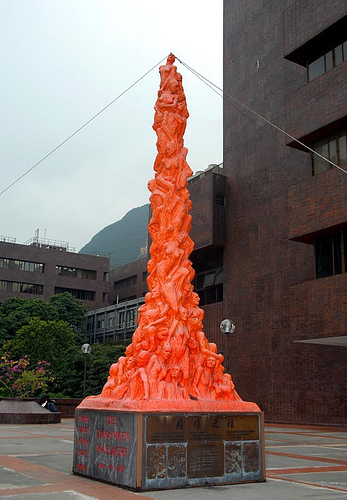 In 2008 the sculpture was symbolically painted orange to raise awareness about human rights in China. On the base of the statue, is the history and pictures of the massacre and also includes the words “The Tiananmen Massacre”, “June 4th 1989” and “The old cannot kill the young forever.” in both English and Chinese. Galschiot erected three other Pillars of Shame. One is located at the Ostiense Air Terminal, Rome, Italy, and was erected in 1996, during the FAO Summit, and depicts the deaths caused worldwide by hunger due to the uneven distribution of the world’s resources. The second is in Acteal, Chiapas, Mexico. It was erected in 1999, to mark the site of the December 1997 massacre of 45 members of the civil society group Las Abejas in Acteal. And the third one is in Brasilia, Brazil. it was erected in 2000 in homage to the victims of the Eldorado dos Carajás massacre which occurred in 1996. This was later moved to Belém, the capital of Pará, the federal state where the massacre occurred.